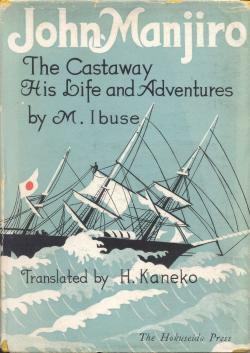 John Manjiro the Castaway, His Life and Adventures, by M. Ibuse, tr. H. Kaneko, Hokuseido, 1941, 136pp. A fifteen year-old fisherman of Nakanohama in the province of Tosa was one of the first Japanese to set foot in the United States, in 1841. I did not realise how important he was, and bought this book mostly as an adventure story. It starts off well with the shipwreck, and several months stay on a desert island, where Manjiro and his three ship-mates ate seaweed and albatrosses. There they were rescued by Captain Whitfield of the whaling ship John Howland out of New Bedford. Whitfield drops three of the Japanese in Honolulu, but invites Manjiro to his home in Fairhaven, near New Bedford (it would be fun to attend the Manjiro festival there!). Manjiro lives in the US for about six years. In a major failure of imagination (or research) on Mr Ibuse's part, this period flashes by in a few pages, whereupon JM, at 21 feels the call of the sea again. After some work in the Gold Rush, he meets up with his surviving compatriots in Hawaii (one Goemon had acquired a wife and Christianity, but discarded both). They set out on the Sarah Boyd, bound for China, which dropped them in their own boat south of Okinawa. This helped them avoid the usual Tokugawa punishment of death for leaving the country and fraternising with foreigners. But the changing times helped as well: in Kagoshima, Manjiro says that "in America the value of a man was judged according to his ability, " whereupon "the Lord nodded a great nod." I wonder if this book, published just before Pearl Harbor, is trying to portray Japan's relationship with America in a positive way? A large part of the story is about Manjiro's many-month trial, or debriefing. He describes railroads and telegraphs and school slates. After Commodore Perry arrives, Manjiro is made an official with two retainers. Later he accompanies the first ambassadors to the US. But what he mostly seems to have wanted, was to build a Japanese whaler and captain it. A great story, told fairly baldly -- there seem to be many other works on this subject; some many be more engaging. Jan asked: Baldly or Badly? I replied: Baldly. It wasn't that bad. Frank wrote: Interesting. Manjiro is also a major character in the Stephen Sondheim musical Pacific Overtures , which is about Commodore Perry's arrival in Japan and its aftermath. I knew the musical's Manjiro character was based in fact, but did not realize that his story was well-known -- or that the musical followed it so closely. I replied: Nor had I ever heard of that musical, which sounds interesting! Do you like the 2004 or 1976 CD? Frank added: The show was one of Sondheim's artiest and least popular, even though it came in the middle of what most people would say was his greatest stretch of work: after Company/Follies/A Little Night Music and before Sweeney Todd. The original 1976 production had an all-Asian, virtually all-male cast and told the story from the Japanese perspective using Japanese theatre techniques. Exactly what Broadway in the 1970's was looking for. The score is quite superb, including one of Sondheim's all-time best songs ("Someone in a Tree"), a Gilbert & Sullivan parody, and an intricate serenade for three male voices in counterpoint that G and his Harvard glee club cronies sing (after a few drinks) endlessly at every opportunity. The 1976 original Broadway cast recording is the one to get. (It's usually the case with Broadway scores that the original cast recording remains the best.) Second choice would be a recording from the English National Opera (which did the British premiere) from the late 1970's-early 1980's, particularly if you can find the 2-CD set that recorded most of the show. That recording is more complete than the 1976 CD, but more operatic and less character-ful. The 2004 recording is a distinct third choice -- more up-to-date recording techniques, but a reduced size orchestra and less-than-compelling performances. The CDs should include a synopsis of the plot but, if you get super-interested, the script is published and should be readily available (or I can send you a copy). Major Sondheim nut here, if you couldn't tell.